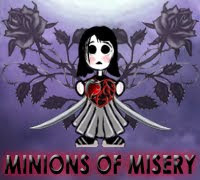 The Minions of Misery Award. So this is how it works…I’m going to share one dark book, one dark movie and one dark secret…and then I’m going to tag other goth-worthy folk to continue the fun! One Deliciously Dark Book: The Book of the Damned by D.A. Fowler: This book scared the crap out of me when I was a teenager. It’s classified as horror and is very dark and very disturbing…it’s also hard to find because it’s been out of print for a while. This is a book about a book that curses the people who read it…ingenious really…at one point I actually tossed the book across the room because I was so freaked out that I was going to start hallucinating like the characters in the novel. One Devilishly Dark Movie: Donnie Darko – I guess I could have gone with some horror flick or something gothic and animated but I love this movie. It has disturbingly dark themes that incorporates fantasy and sci-fi in a very cool way. Plus that freakin’ guy in the bunny costume is creepy as hell. One Sinful Little Secret: I’ve got a big tattoo of Jack Skellington on my thigh…and if you don’t know who that is, well, you’re just not goth enough I guess. Krista Walsh - A cute little goth girl who has a "thing" for ravens. Minions are good, but I don't think of you as a minion. Dark genius, indeed. Great concept for an award. Love it. Lol I love it! Great choices too, although I haven't read The Book of the Damned but it definitely sounds interesting! Wow, delightfully dark. Thanks Angie. I like it - it's very cool, sinister, morbid and not entirely cute at all. Great concept and love the artwork. I see it spreading across the underbelly of the web, and growing in its darkest recesses. LOL! Love it! Great concept and Wonderful teamwork! love the award! and the facts. Check out my "Blog" sometime I post often , Not much else to do of late.....It is "Dr. Theda's Crypt"